Think of this grilled steak salad as Meat and Potatoes 2.0. 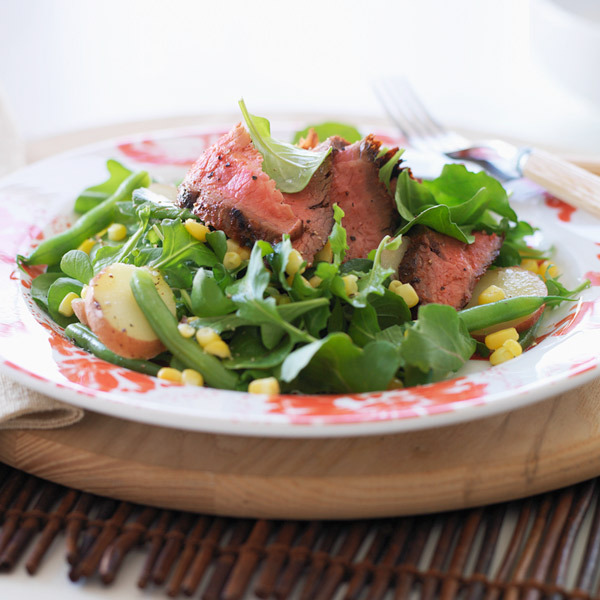 In this hearty Steak Salad recipe, the well-known pair are joined by green beans, corn and arugula and tossed with a sweet and spicy ancho-chili vinaigrette. Our easy recipe features versatile and inexpensive flank steak (bonus: it's tasty, too), so for fork-tender results, thinly slice the steak across the grain before adding to the salad. Cook potatoes in pan of simmering salted water to cover until tender, 15 to 20 minutes. Cut into ½-inch slices. In separate pan of boiling salted water, cook beans until crisp-tender, about 5 minutes; add corn for last 1 minute. Drain. Preheat broiler or grill. Combine salt with 1 teaspoon each chili powder and sugar. Sprinkle on steak; rub with oil. Cook to medium-rare, 8 minutes. Let stand 10 minutes before thinly slicing. In large bowl, whisk together ketchup, ¼ cup water, vinegar, 2 tablespoons brown sugar, mustard, 2 tsp. chili powder, cumin and coriander. Add arugula, potatoes, beans, corn and steak, and toss to combine.